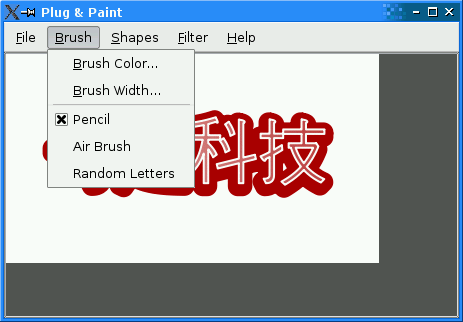 The Plug & Paint example demonstrates how to write Qt applications that can be extended through plugins. If you want to learn how to make your own application extensible through plugins, we recommend that you start by reading this overview, which explains how to make an application use plugins. Afterward, you can read the Basic Tools and Extra Filters overviews, which show how to implement static and dynamic plugins, respectively. The next step is to load dynamic plugins. We initialize the pluginsDir member variable to refer to the plugins subdirectory of the Plug & Paint example. On Unix, this is just a matter of initializing the QDir variable with QApplication::applicationDirPath(), the path of the executable file, and to do a cd(). On Windows and Mac OS X, this file is usually located in a subdirectory, so we need to take this into account. The argument to Q_IMPORT_PLUGIN() is the plugin's name, as specified with Q_EXPORT_PLUGIN2() in the plugin.